The first woman to go into space is now a member of the Russian parliament, the State Duma. A Rossiyskaya Gazeta correspondent interviewed Tereshkova in her office. Rossiyskaya Gazeta: Are you a fan of extreme experiences? 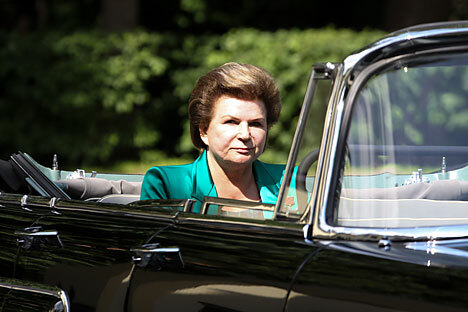 Valentina Tereshkova: I have never thought of myself as a lover of extremes. Each person does their job, comes up against difficulties and overcomes them. Back then, many people dreamed of going into space. When Gagarin first did it, it inspired so many people. Especially athletes who did air sports. In late 1961, I was invited to undergo selection for a space mission. Five young women were selected from over 1,000 contenders from all over the country. We were supposed to test new equipment. We had to undergo comprehensive checks: of our physical training, emotional resilience, etc. Starting from early 1962, we began active training. The head of the team, Yuri Gagarin, was a very demanding leader despite all his charm. The training was focused more on the psychological than the physical aspects. We all were experienced parachute jumpers who had made parachute jumps during the day and at night, on land and on water. But each time there was something new for us. Starting with zero gravity. Back then there was no special simulator, or hydro laboratories. Instead, an aircraft would perform special figures to create brief moments of weightlessness so that we could feel it and get used to that feeling. In a special spinning chair, we had not just to sit but also bend our upper body forward. In the heat chamber, we had to remain in a spacesuit at temperatures of 70 degrees Celsius (158 degrees Fahrenheit) above zero. Another test consisted of spending 10 days in a soundproof isolation chamber. R.G. : How did you cope with being alone and in a confined space? V.T. : I never suffered from claustrophobia. The isolation chamber test was used to check trainees' emotional state, heart condition, and numerous other parameters, like eyesight for example. Back then, cosmonauts were allowed to take only one book with them on a mission. I chose a book of poetry. On Sep. 26, 2014, Yelena Serova became the first Russian woman to go into space in the last 20 years. She will spend several months on the International Space Station doing research alongside her male colleagues. Some people think that while in space, a cosmonaut is left to their own devices and therefore feels lonely. In fact they have a busy program to complete. One part of this was obligatory physical exercises. I had to measure my blood pressure at given times, take blood samples, and do all the other tasks. In addition, I had to thoroughly study the spacecraft, all its equipment and devices. Each space mission is an ordeal and each has brought something new to space exploration. Women in space have a lot of prospects. The space training center that we set up with our own hands is now training women for space missions too. Incidentally, speaking of sanctions. American astronauts are training together with ours and are flying on our spacecraft. It is not in their interests to impose any sanctions. We work together with them when they come to our space training center to learn how to fly on our spacecraft, while our cosmonauts go to the NASA center in Houston. However, the Americans are now breaking the terms of our cooperation. We have warned them: If they introduce sanctions, we shall retaliate. V.T. : Of course. Sadly, my age is not right for that. I very much wanted to go to Mars. I had spent many years studying the planet, reading everything that had been written about it. R.G. : In June 1963, you, under the call sign of Chaika, orbited the Earth 48 times. At take-off you said those now famous words: "Hey, the sky out there! Take off your hat!" Do you celebrate that date? V.T. : We maintain the traditions that were started by Yuri Gagarin. We gather together, we recollect the old times and talk about our profession, and the new and interesting things in it. It is a meeting of professionals. We share the little joys of our earthly lives too. I have among my friends American astronauts, and two female astronauts - French and British. Our profession brings people closer, it shows who is worth what. Politics is completely out of place here, the only thing that matters is a cosmonaut's professionalism. R.G. : Having been to space, do you believe that there is extra-terrestrial intelligence out there? V.T. : So far, all scientists' efforts to find some sentient form of life outside Earth have failed. But the universe is immense. We cannot rule out that there are planets in it where life does exist. If there are living creatures out there, they are very, very far away. And they are not making contact. We send information about our Earth and people on it out there all the time. But we have not yet heard anything back, although we have been scanning the universe for decades already. First published in Russian in the Rossiyskaya Gazeta newspaper.